Sootopolis City is quite large, and shaped like a ball. To the west of the city is the PokeMart and some buildings. To the right of the city is the Pokemon Center and some buildings. At the center of the city is the Gym. 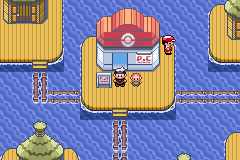 What you want to do now is go from the PokeMart's side (west) and go to the north of the city. There you'll meet Steven and his friend, Wallace. Wallace is also the Gym Leader. They'll take you to a cave known as the Cave of Origin. You'll need to use Flash in order to see more of the screen. As you walk deeper, you'll encounter some fog, and then HM 07 - Waterfall. Also as you go, the legendary monster roars over and over again, rumbling the cave as it does. In the last room, you'll meet the creature of your version, Groudon for Ruby, and Kyogre for Sapphire. Go near them, and your Orb will glow, and the Pokemon will battle you! They are lv. 45, and are quite strong. I suggest that you don't use your Master Ball on it, since there are more legendaries later on in the game. First save the game, so you can always try to catch it again if you messed up. Try to put it to Sleep, or get its HP real low. Then throw an Ultra Ball. After catching it, get back outside. You'll find that the world has been restored to how it used to be. 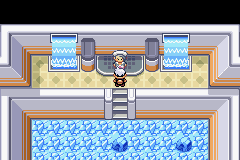 Now go to the Pokemon Center, and heal your Pokemon. Then go into the house right next to it for a Wailmer Doll. After that, surf across the water to the other side. In one of the houses there, a Blackbelt will give you TM 31 - Brick Break. Finally, it's time to get your last badge. Surf to the gym in the center of the city, and get ready to rumble! 1 step right, 1 step up, 2 steps left, 1 step up, 1 step right, and climb the stairs. 1 step up onto the ice, 3 steps left, 2 steps up, 2 steps right, 1 step down, 3 step right, 1 step down, 1 step right, 2 steps up, 3 steps left, and climb the stairs. 1 step up onto the ice, 2 steps right, 1 step up, 2 steps right, 1 step down, 1 step right, 3 steps up, 2 steps left, 1 step down, 1 step left, 1 step up, 1 step left, 2 steps down, 2 steps left, 1 step down, 1 step left, 1 step up, 1 step left, 1 step down, 1 step left, 1 step up, 1 step left, 2 steps up, 1 step right, 1 step down, 1 step right, 1 step up, 1 step right, 1 step down, 1 step right, 1 step up, 1 step right, and climb the stairs. After all that, you can battle the gym leader. He's Wallace, and you've just met him a while ago. Now you're going to battle him for your final badge. He has the following five Pokemon: a lv. 40 Luvdisc, a lv. 42 Whiscash, a lv. 40 Sealeo, a lv. 42 Seaking, and a lv. 43 Milotic. The last Pokemon, is of course, the hardest to defeat. Milotic knows Recover, so knock it out quickly! After winning, you'll receive TM 03 - Water Pulse and the Rain Badge. Now all Pokemon will obey you, and you can now use Waterfall outside of battle! Leave the gym simply by falling through the ice. You've done it. 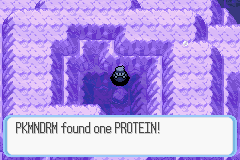 You've traveled and collected all eight gym bagdes. Your final destination now is the Pokemon League in Ever Grande City. Leave Sootopolis City by diving at the dark waters south of the city. Get out of the small cave, and resurface. Go east, and then south onto Route 128. As you go south toward your destination, you'll notice many patches of dark water. Dive down whenever you see one, because there just may be an item underneath. The Protein shown on the left was found by diving into a dark patch of water surrounded by white-colored land. You'll be going south for quite a while. When reach Route 129, start going west. Go west from Route 129. You'll meet some trainers, continue on to Route 130, and find the Sky Pillar in the middle of Route 131. Here, you can try to catch the legendary Pokemon Rayquaza. Sky Pillar will only be open to you after you defeat the Elite 4. Sky Pillar is a kind of secret tower in this game, and contains a vicious looking legendary Pokemon. Enter the cave, and go into the tower. The first floor is pretty simple: just walk up the stairs. You'll find cracks on the floor on the second floor. Use your Mach Bike to get past it. There will be two staircases on the third floor. Take the one on the right to get to the fourth floor. This is the tricky part. The cracks here are hard to get through, as you'll need to cruise through every one of them on your bike in one go. If you stop, the bike will lose it's momentum, and you'll drop down. Go to the middle roughly where the area of the middle stairs in the previous floor, and drop down. From here on, just find your way to the staircases, and everything will work out fine. 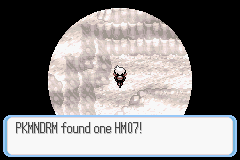 That is, until you reach the sixth floor, where a legendary Pokemon awaits you. It's a lv. 70 Pokemon: Rayquaza. It is a Dragon/Flying type, and will knock your Pokemon out real quick if you're not careful. Also known as the Sky High Pokemon, Rayquaza is the strongest Pokemon in this game (nearly equivalent to Mewtwo in Red/Blue/Yellow). So you better be careful, 'cause you have a deadly dragon on your hands. Pacifidlog Town is a weird looking place. It is a few houses floating on water, connected by logs. There isn't any real meaning to this town until later in the game, when you need to fly here. There's no point in going on to the next routes, which is also known as Ocean Currents. Once you go here, it'll automatically move you. You won't need to go here until later in the game. Now you can Surf east towards Ever Grande City.